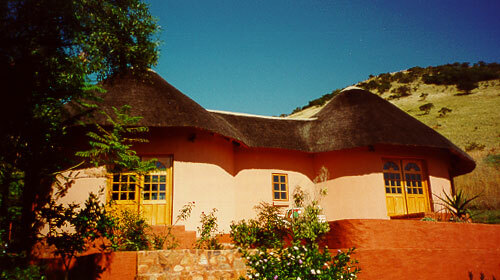 Luxury thatched self-catering accommodation with stunning views of the dam. The Farmhouse has a spacious master bedroom (with ensuite bath & toilet), a guest bedroom (with ensuite shower & toilet) plus an open plan kitchen, TV, Internet and DVD player (available on request). The Rondavel consists of two large rooms each with private bath and toilet plus a small cooking facility. Both accommodations are serviced daily. They can be rented separately or together. it has a lovely swimming pool with a braai area, for your leisure. We will ensure everything you need is to hand for a hassle-free stay. Golfing, walks horse riding and water sports nearby.